The cool thing about the 90 day challenge is that it is holistic. We don’t just laser beam focus on one single aspect of your life and let everything else go to pot. We work in multiple areas at the same time but in ways that are interconnected. For example, You can’t pursue your passion and dream career if you have no energy… so taking care of your body and eating foods that increase your health, vitality and energy is a crucial piece of the puzzle. You may be literally dragging around a few bowling balls worth of excess weight. And right after the New Year is traditionally when people start their next diet failures. And I “get” that. Weight loss may be YOUR “purpose problem” but for me it was my music and the lack of physical energy I had. One of the reasons I used to get deeply depressed and distressed at the thought of traveling around performing my music was that I could barely get through the day without at least one nap. I felt physically like I was constantly dragging several large bowling balls around with me every where I went. I couldn’t imagine that traveling and performing the way I felt would feel good. It seemed hopeless and pointless. I don’t know if you can relate to that, but our actual greatest personal wealth HAS to be our health. REMEMBER your unconscious mind is your IMAGINATION. So whatever you are imagining you can’t do is actually an extremely effective form of self hypnosis. IMAGINING WHAT YOU CAN DO is hypnosis as well. So hand in hand with my personal healing work and journey to learn the kinds of skills and mind mastery methods that would get me farther, faster, easier, better… was taking care of my health. And that process of necessity focuses on your gut. Our digestion is perhaps the most neglected form of self improvement and personal mastery. The high sugar (and I’m including grains and starchy vegetables like potatoes here) low fat, low fiber American diet is quite literally killing us AND making us miserable. It is also robbing our brains of the kind of fuel that cuts through the fog and allows us to think clearly. To that end, fermented foods have made a hugely positive impact on my own health. 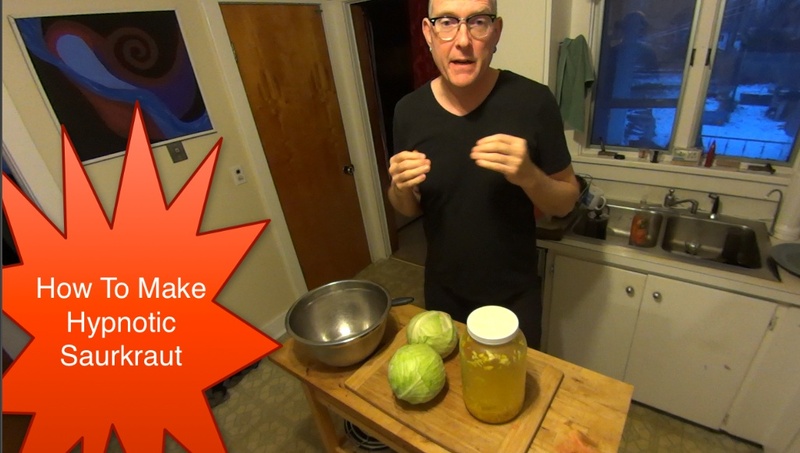 One of the greatest tools in my own arsenal of healing foods, is Sauerkraut. NOT the pasteurized stuff you get in the regular grocery store, but the real stuff you can get at a good whole foods store or actually make at home in 10-15 minutes with just salt and a few other optional spices like tumeric, caraway seeds etc. Yesterday, I noticed was almost out so I made some more and I video taped it while I talked. Today I’m working on the technical details of 90 day challenge and how to deliver the goods to you. I will most likely be able to do an online meeting to answer all your questions… so look for that special announcement later today about the timing and schedule of that for either Tuesday or Wednesday.